✖ Janet Yellen is kicking around the idea of backing off of the Fed’s 2% inflation target. ✖ If the Fed lets the economy run hot, the yield curve will steepen. ✖ Gold looks vulnerable with real yields still too low. Janet Yellen, in a speech on Friday mentioned that the Fed could choose to allow the U.S. economy to “run hot” to allow for an increase in the labor participation rate. In typical Fed fashion, the goalposts are being moved once again, and the implication for the yield curve is important. Janet Yellen’s comments on Friday indicate that this scenario is increasingly likely. It seems that the Federal Reserve, rather than taking a proactive stance against inflation as it has done in the past, it is going to be reactionary. If this is the case, investors can shift their attention from leading indicators like unemployment claims and wage growth, and instead focus on lagging indicators like PPI and CPI when assessing future Fed action. The fixed income market is still pricing in a 65% likelihood of a rate hike in December, and given the abundance of dissenters at the September meeting, as well as recent remarks from Stanley Fischer, we expect the Fed to raise in December. After which, we presume the Federal Reserve will declare all meetings live and “data-dependent.” We expect that the Federal Reserve will NOT raise rates again until the core PCE deflator (their preferred measure) breaches 2%. If they do choose to let the economy “run hot,” the market will need to figure out what level of inflation the Federal Reserve considers to be “hot.” Is it 2.5%? Is it 3%? At what level does the labor participation rate need to reach for further Fed normalization? In terms of the equity markets, we expect the broad market to rally into year-end after the election – whatever the outcome. Bearish sentiment is still pervasive, and Fed inaction in the face of higher inflation should be welcomed by equity investors, at least in the short run. Holbrook is also cautious regarding gold. Gold is often described as an inflation hedge. However, this is incorrect. 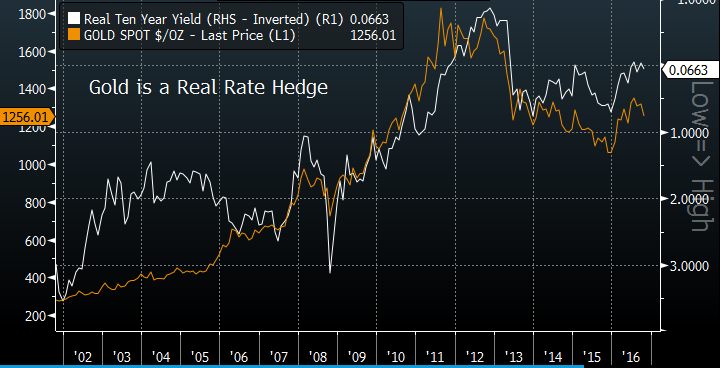 It is a real rate hedge. As real rates move lower, gold moves higher, and vice versa. With real rates at historical lows, we think there could be further weakness in the yellow metal. The fixed income market is in the early stages of pricing in a “run-hot” economy. 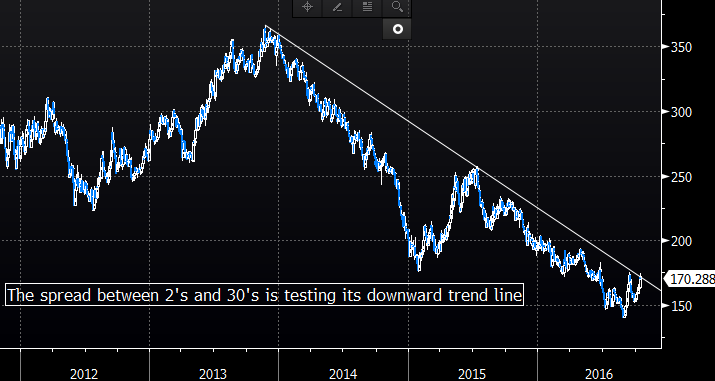 The spread between the yield on the thirty-year bond (most sensitive to changes in inflation) and the two-year bill (sensitive to Fed action) is testing its five-year downtrend. A successful breach indicates that the market has changed. The Federal Reserve is willing to keep rates low, or inflation is on the horizon, or both. Holbrook’s research shows that during the current bull market, a bear steepening trade (long yields rise more than short-term yields) has implied solid market returns. The S&P 500 advances an average of 2% monthly in this environment. This environment is second only to a bull steepening trade (where short-term rates fall faster than long-term rates) during which the S&P 500 rose more than 3.5% monthly. Flattening yield curves were detrimental to equity returns. You can see the analysis in our prior perspective, “Trouble with the Curve.” In any case, a steepening yield curve should bode well for equity prices. Meanwhile, there is ample evidence that inflation is starting to make a comeback. 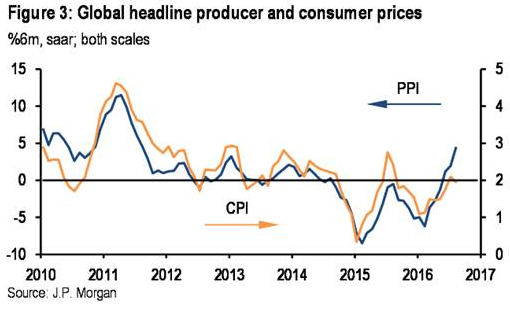 Global producer price indices generally lead the CPI and they have been spiking this year. CPI will likely follow, and not just in the United States. And finally, although the dollar has rallied over the last couple of weeks in expectation of a late-year rate hike, much of the deflationary effect from a stronger dollar is behind us. The chart below tracks the year-over-year percentage change in the dollar (green line, inverted) versus the year-over-year change in goods inflation (yellow line). The dollar typically leads by four months and as such is lagged in the graph. This entry was posted in Amerca, Banking, Economy, Hillary Clinton, Housing Market and tagged Fed Rate Hike, Hot Economy, inflation, mortgage interest rates on October 19, 2016 by Bone Fish.